I have a friend that loves Greek food, I mean LOVE and she is Italian. I remember making individual triangle spanakopitas, from none other than Ina Garten, for a school project and a friend of ours did not want to eat it so he threw it out. Needless to say, she was quite sad about it. So this is for you Lauren! If you happen to live in New York and travel to Astoria, where Greek food is prominent, you should check out Titan foods. It’s a Greek supermarket with every Greek food imaginable. 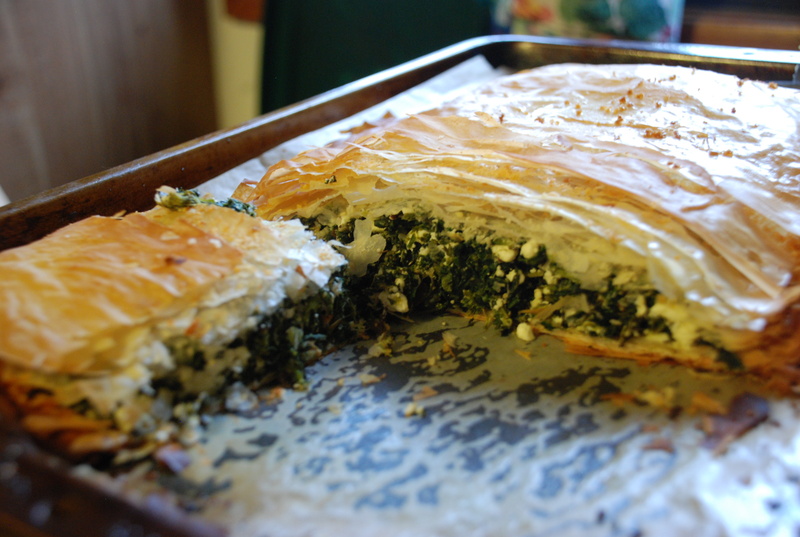 The recipe for this spanakopita is different than that one I made before because I made it into a large pie, phyllo dough, filling, phyllo dough. I learned that this is the true way it is made from an authentic Greek person and from reading multiple recipes. I took a shortcut when oiling the phyllo dough. I used cooking spray instead of brushing on extra virgin olive oil since it was so much easier. I also, (you don’t have to do this) added panko bread crumbs in between the layers with the olive oil to help separate the layers. All the lovely ingredients. Sadly the lighting was bad so I needed to use flash and I really don’t like to use flash. 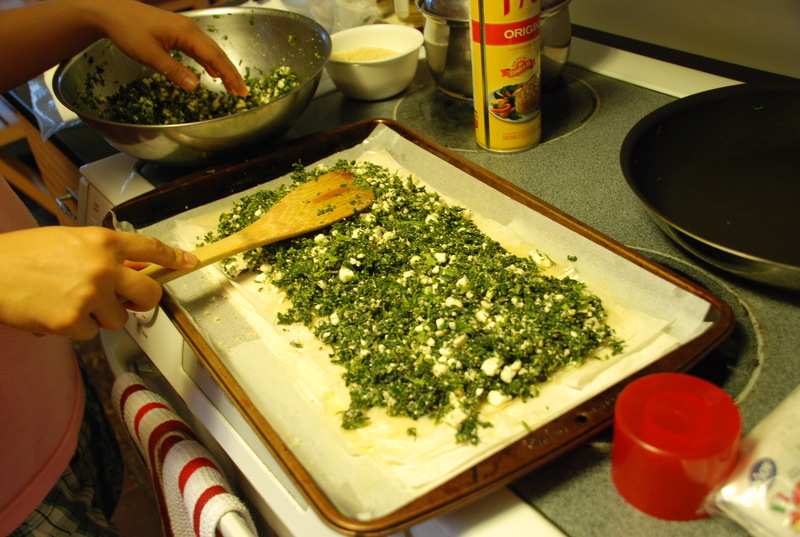 Spinach mixture with feta cheese! 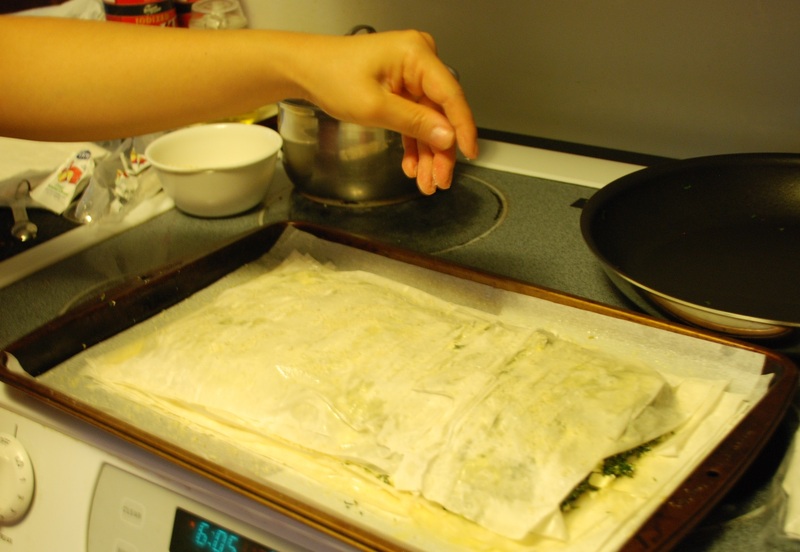 Spreading out the ingredients on the of the bottom layer of phyllo dough. Covering the filling with the remaining phyllo dough and sprinkling a little panko in between the layers. Look the flaky golden brown goodness! Yum! 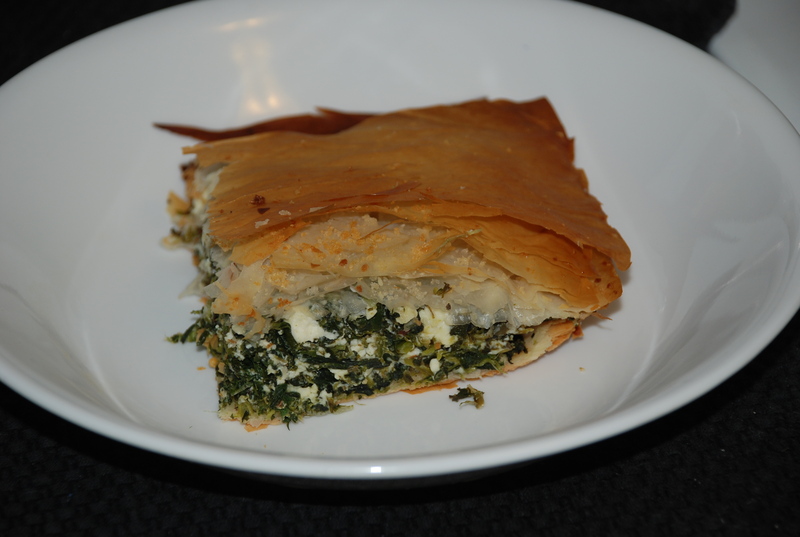 the spinach and feta cheese! Heat 4 tablespoons of olive oil in a large saucepan and sauté the onions and leek until translucent, about 2-3 minutes. Add the spinach and saute until the leaves have wilted. Then remove the spinach mixture from the pan and drain out the water. Remove the pan from the heat and allow to cool somewhat. When cool enough to handle, finely chop the spinach and place in a large bowl. Lightly oil a 12 inch in diameter, metal baking pan (you can use a larger baking pan – you will just have a thinner pie, but don’t use a smaller one), or a 10 x 15 inch rectangular baking pan. 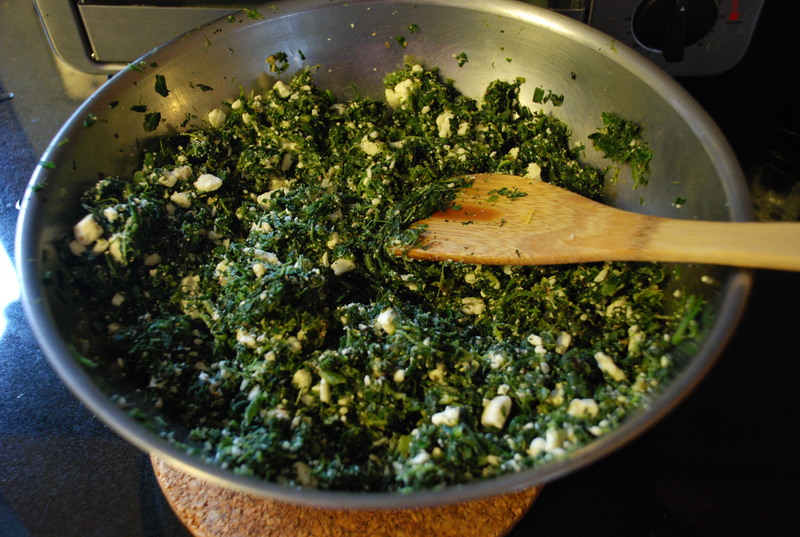 Add dill and feta cheese to the spinach. 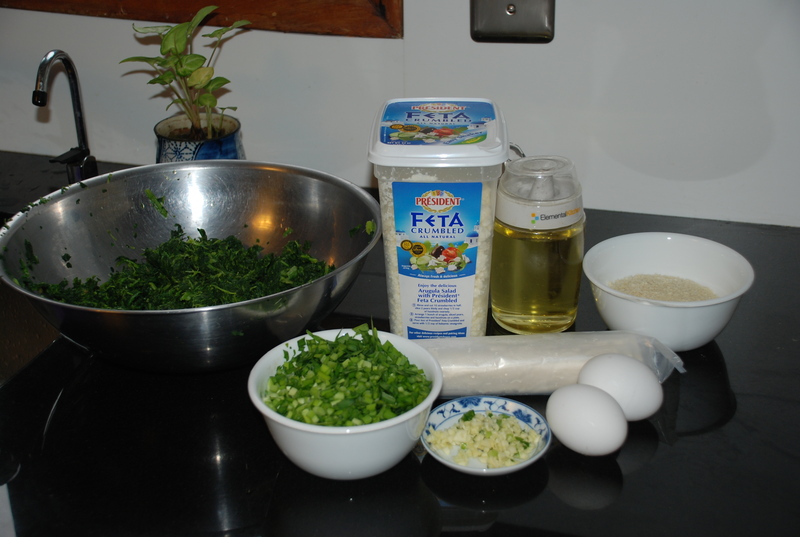 Add salt and pepper to taste (careful with the salt – the feta will add quite a bit of its own). Pour the eggs over and give a stir to combine well. Open up the phyllo pastry and place on a work surface. 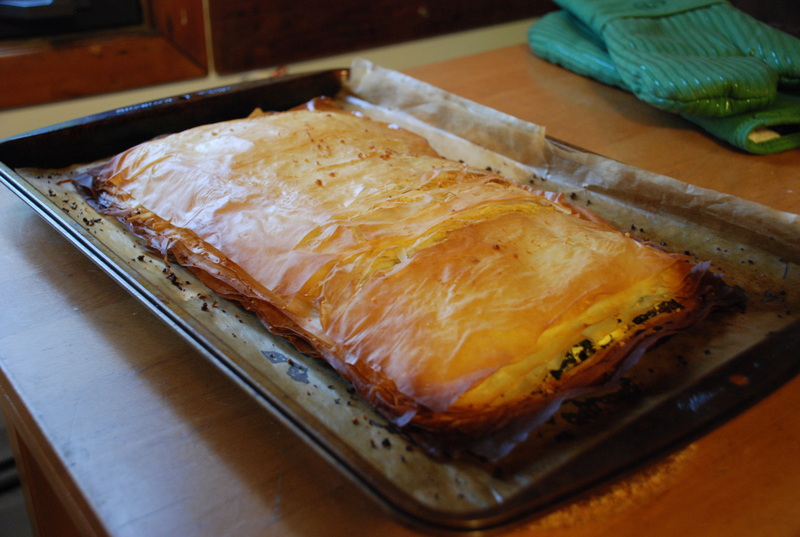 If using the country style pastry proceed, if using the thinner phyllo; cover with a damp cloth. (Continue to cover the pastry sheets with the damp cloth each time you remove one as you prepare the pie.). Layer the phyllo in the pan, allowing the edges to hang over the sides of the pan, brushing each phyllo layer generously with olive oil. Use up half the phyllo sheets (about 10 sheets) to make the bottom pastry layer, allowing excess pastry to drape over edge of pan. Put the spinach mixture in and press the top down gently to smooth filling. Tuck in the pastry draping over the edges. Repeat layering with the remaining phyllo, oiling each sheet generously. Using a sharp knife, score the upper layers of pastry into the size pieces you will want to serve once the pie is baked- BE CAREFUL NOT TO CUT THROUGH BOTTOM PASTRY. Cool till just warm. Cut into serving pieces and serve either just warm or at room temperature. .
one of my fav meals!